A diverse collection of poetry and short stories provides students with the opportunity to read a wide variety of texts and to explore, discuss, and write about different text features and stylistic elements. Shakespeare’s Twelfth Night (both the play and modern productions) acts as starting points into exploration of modern situation comedy formulas, timeless humour, script adaptation, target audience, casting, and advertising. Students will complete a number of assignments by focusing on the theme of adapting Twelfth Night for a modern television audience. There are two novels to choose from in this unit. On reading a longer work of fiction students will bring several reading and writing skills to their assignments. The novels are presented in the following ways: students are asked to read the novel in sections. In each section students are provided with some comments on the characters and details from the plot. The notes will comment on the main characters as students get to know them. Because the novel contains some difficult vocabulary, definitions for words students may not know are provided. Each section of the novel will contain an idea from the novel to write about and submit to the teacher for evaluation. This unit focuses on the development and understanding of active listening skills, good note-taking, planning an effective presentation, and speaking skills and vocal strategies. Students will listen to, and critically engage with a variety of lectures and presentations. Students will also plan, prepare, and deliver their own oral presentation in video format. English 1D presents students with what is likely their first experiences with Shakespearean comedy, it provides choice for students as to which novels they study, and it introduces the concept of the anthology which contains accessible poems and short stories, all of which become material for studentsâ€™ reflections, discussions, and writing. Beginning by studying the concept of what an anthology is, students are presented with a variety of verse forms. 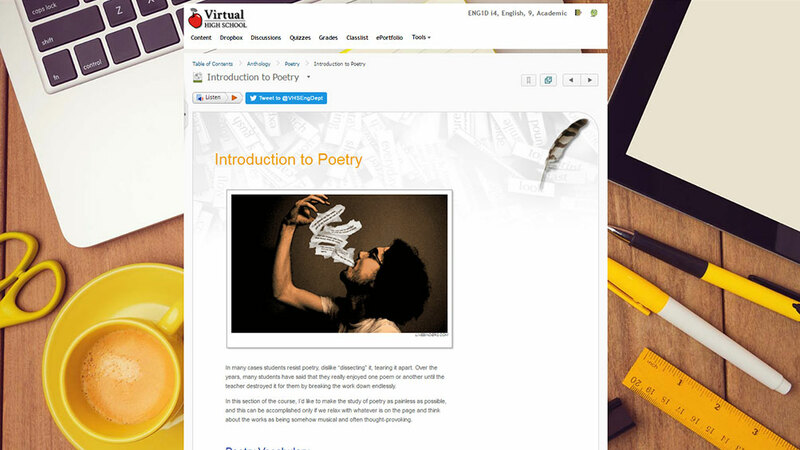 The emphasis on the poetry section is on reading for meaning by introducing literary terms through the use of videos and relating these concepts directly to the poems under study. VHS videos in the course illustrate topics such as creating video, literary devices, and MLA formatting. VHS Videos present animations and audio clips that deal with the elements of fiction: plot, setting, and characterization, as well as literary terms, for use in study of the stories. The study of Shakespeareâ€™s Twelfth Night focuses on the playwrightâ€™s use of devices that are now commonly seen in media, specifically in romantic and situation comedies. Rather than conducting an exhaustive study of the play, at this level teachers have students keep a portfolio of their reflections on scenes that advance the plot.